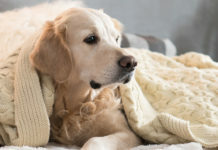 We’ll be looking at the best elevated dog beds in this review and at some of the features and benefits of using a raised dog bed in your home. If you are in a hurry you can check out our top five picks using the links in the box below. 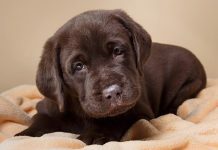 Scroll down for a more detailed reviews of the top five raised dog beds. And for pros and cons of using an elevated dog bed. I’m fairly new to elevated dogs beds and I am a complete convert. Raised dog beds are ideal for our home because I use a robot vacuum cleaner which can easily clean underneath the beds without me moving them. 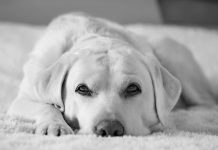 It turns out that elevated dogs beds have lots of other benefits, for me and my dogs, so we’ll be looking at those too. Why did I start using elevated dog beds? 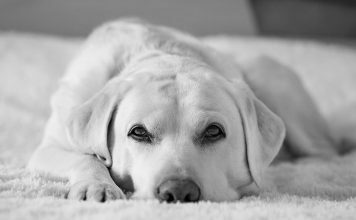 My robot vacuum cleaner runs around downstairs early each morning scooping up dust and the dog hair that comes off my eternally shedding Labradors. Because it lets the robot vacuum cleaner scurry underneath and keeps the dog’s bedding from getting hairy a raised bed of some kind is a must. For a long time I used baskets on legs, and I still do in some rooms in the house because they are pretty. Why did I switch to a cooling raised dog bed? It wasn’t the cooling part that actually appealed to me, but the anti-chew aspect of these beds. One of my dogs is a basket chewer and bed destroyer, and I had heard that the stretched surface of an elevated dog bed is harder for dogs to chew. 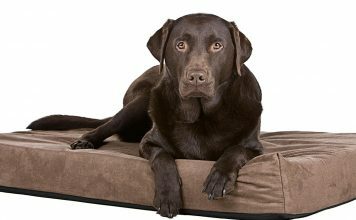 Are elevated dog beds chew proof? In my case the elevated bed has been a big success. It has completely prevented my Lab from chewing the fabric. Only one of the dog beds above actually claims to be chew-proof, and that is the Kuranda, however, most are pretty chew resistant. The tighter the tension in the fabric, the harder it is for the dog to get a grip on it with his teeth. But there have been some other benefits to a raised dog bed that I had not anticipated. The first benefit for me, is that ALL my dogs love it. So much that they all pile onto it in a heap. It happily takes the combined weight of two full grown Labs and a spaniel. You could put blankets on the bed and I know that some people do, but I think that counters some of the benefits. My dogs are just as happy lying on the fabric of the elevated dogs beds as they are on the cushions in their fancy baskets. Probably because the base of the basket has less ‘give’ and spring. In most dog beds, the interior of the basket and the cushions that line it, get very hairy and dusty. 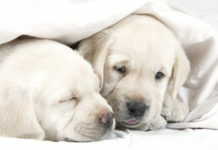 The dogs end up sleeping in a hairy nest and the blankets and cushions are really difficult to get clean. This encourages doggy odors. My beautiful (and relatively expensive) dog baskets are heavy. Not so heavy that I can’t lift them, but heavy nevertheless. 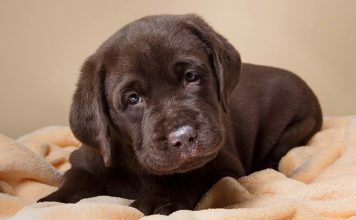 My dogs are working gun dogs and we live in an often rainy, muddy country. So our dogs are frequently wet when they get home. Towel drying leaves dogs damp, but in a warm room on an elevated dog bed, the dogs dry very fast indeed. This is a real benefit for my dogs. And for any dogs that regularly swim or exercise in wet weather. 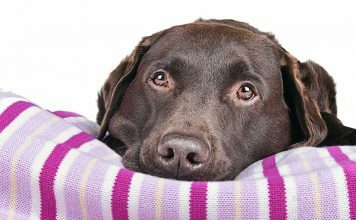 If your dogs sleep on the mesh fabric of their raised dog bed they will be cooler than if they sleep on blankets or a cushion. That’s because air can pass under and through the fabric. So do you need blankets on a raised bed? It depends on your home. Our home is on the warm side and not draughty. The utility room where the dogs sleep is cosy and the bed is fine as it is. Our top five beds listed above all have features we liked. 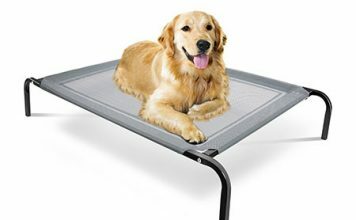 This is the original elevated cooling dog bed. It is well made, the fabric is tough, and for a raised bed, quite nice looking. It now comes in some additional ‘earthy’ colors – you’re not stuck with green. There is also nutmeg and terracotta which are nice. Plus ‘sand’ and a rather drab grey. The best thing about the Coolaroo is the spare covers. So if your bed does get damaged at some point, or need some serious cleaning, you don’t have to replace the whole thing. There is nothing fancy about the Amazon Basics Cooling bed, but it does the job. One of my dogs did eventually damage mine by repeatedly digging in it. I should point out that the Amazon Basics bed is tough and will withstand normal wear and tear. 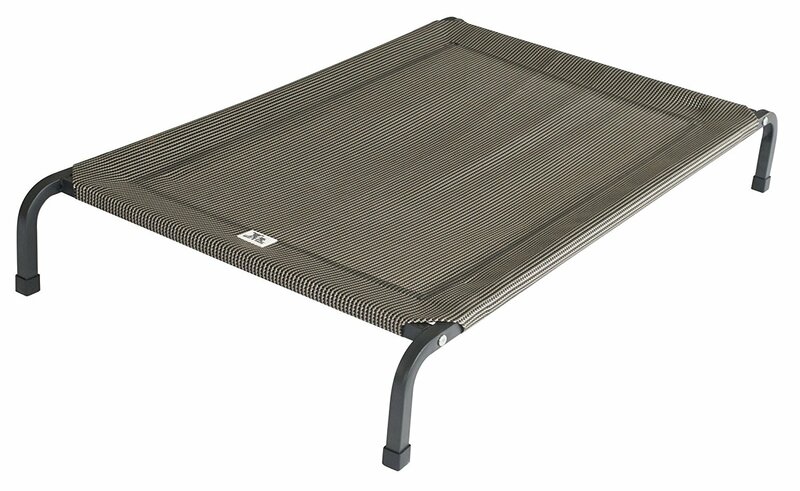 My cocker spaniel uses it as a trampoline, springing up and down into the air! The Spot & Bella bed is another popular make. The legs are squared off rather than tubular and it has a smart, slightly ‘urban’ look to the fabric. Birdrock’s dog cot is slightly different in construction from the first three beds. It has solid fabric around the edges and mesh panels in the centre. This might be an advantage if your dog is a bed ‘digger’! It also has extra legs and can take heavy dogs up to 150lbs in weight. It is available in a range of fairly bright colors. This bed is marketed as being suitable for outdoor use. It is tough and weatherproof. A really sturdy piece of kit. And Kuranda claim it is chew-proof too. The Kuranda elevated chew-proof bed comes in four stylish colors and is usually one of the more expensive beds. So if your dog lives indoors, you might not want to spend the extra. 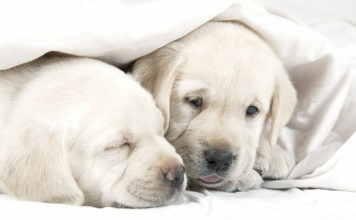 On the other hand, if you have a really determined chewer, this might just be the bed to stop him! There is simply nowhere that the dog can get hold of the fabric. Kuranda also sells a compatible padded cushion to go with this bed. I love my raised dog beds. The only downside to cooling raised beds is that they are not pretty. Immensely practical, but not terribly stylish. They are light but do require a little bit of effort to assemble. It’s easier to assemble them with a helper, as the cover is under tension. It is this tension in the fabric that helps to avoid elevated dogs beds fall prey to those Labradors that like to nibble on stuff. 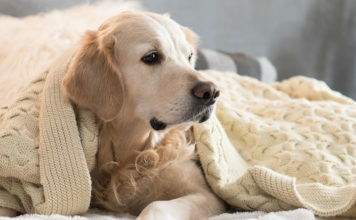 A raised dog bed has loads of other benefits and most dogs really like them. If dollars is your main concern the Amazon Basics is likely to be a good option, though sometimes there are others on offer at a compatible price. If money is no option and chewing is your issue, then the Kuranda is probably your best bet. You’ll need to pay a bit more if you want more choice of colors or a slightly more stylish look. And if you order a bed with the option of an extra cover, you won’t have to fork out for a whole new bed if yours gets damaged. Don’t forget to add your favorite raised bed in the comments box below! 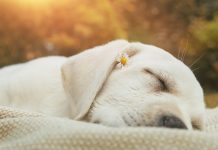 I really love your article on choosing a raised dog bed and what is the best raised bed dog out there. 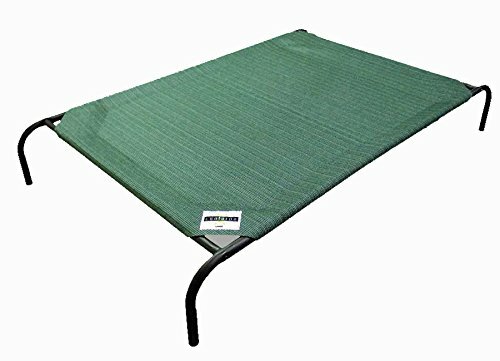 Some of the raised dog beds in the market right now are very expensive and easily destroyed when dogs bite them or play with them. They are very easy to clean and store. This is very helpful. 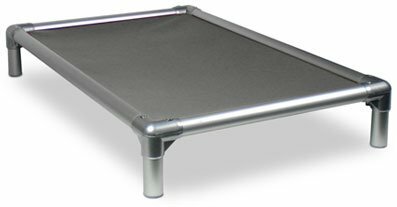 We have been using Kuranda dog beds for many years. Never had one chewed despite having Labs, Rotties and never had to replace one still on our original 3. Expensive but excellent quality – cheaper in the long run. Dogs love them hardly ever lie on the floor. I like how you said that elevated beds help keep animals from chewing through the fabric. We have a dog who loves to tear through just about anything he can get his teeth on which has made it hard to keep beloved pet beds. Maybe we’ll have to try looking for a fabricless solution so he won’t be able to destroy it nearly as quick as he normally would. 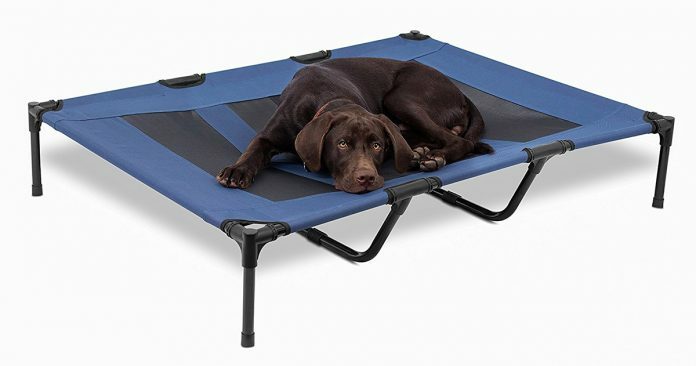 The breeder I got both my labs from recommended the Kuranda bed, and I’ve just ordered one for my office for my service dog so she’s not stuck laying on the hard floor. You mentioned the robot vacuums, I hadn’t even thought of that benefit! If you haven’t already, would you do a review of those like you did for the beds? We moved from Kent to hot and humid Houston, Texas. 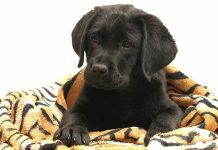 Bought two Kuranda beds for our two large labs. They love them. Were wary of them at first as they didn’t like the mesh. Put a memory foam bed on top and have not looked back. Likewise Roomba Robot cleans underneath easily.